Crann Tara Miniatures will have their new set of 6 Gallowglass minis available over on their website this weekend. 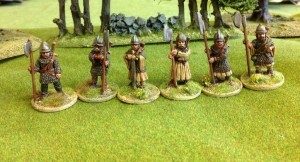 I am pleased to say that the first set of six Gallowglass for the Border Reiver and Irish wars are now ready. I have painted a full set up, all open handed to take either the mean looking axes or pike depending on your fancy. They will be in the shop over the weekend. Sculpted by Martin Baker he has aimed to make them fit in with the current Graven Image range. I will be taking some comparison shots later. Nice for the Irish to get some big lads! Next up will be a pack of Gallowglass advancing/attacking.